Sunday Godwill Budzi is a student in the inaugural class of the School of Christian Social Entrepreneurship. He brings an enthusiasm and dedication to learning that is proven by the path he has traveled to reach this point. Godwill graduated from Prince of Peace Secondary School in 2013, where he received a Cameroon General Certificate of Education (GCE) – Ordinary Level, similar to an American high school diploma. He went on to earn a GCE Advance Level certificate, which he obtained in 2015 at Government Bilingual High School (GBHS) in Ndu. Between earning his O and A level certificates, Godwill completed a computer software training program in Ndu, where he mastered MS Word, Publisher, Excel and PowerPoint. After his computer training, he completed an internship in Bamenda, Cameroon, under the supervision of Ngafeson Beatrice. He earned a certificate in computer software after completing the training program and internship, which he was able to turn into a job at a documentation shop. School Business project – Godwill has done small-plot farming for more than four years and has a passion for this activity. He has acquired experience and skills in the cultivation of carrots, lettuce, a variety of spices and cabbages. He’ll use that expertise for his School Business Project, which is sustainable market farming and pig farming. These projects will cost about 50 million Central African francs, or about $85,000. Humanitarian Goal – In keeping with the mission of the School of Christian Social Entrepreneurship, students must commit to humanitarian work in their communities. In his village of Njipluh, Godwill plans to assume responsibility for the school needs of five orphans from elementary through high school. He also has committed to care for widows who are senior citizens and are finding it difficult to make a living. Godwill hopes to increase the number of orphans and widows he assists as the profits generated from his business project increase. 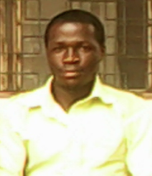 Church Work and Other Interests – Godwill is an active member of Bethel Baptist Church of the Cameroon Baptist Convention. He served as a Boys Brigade Captain for eight years, teaching discipleship to boys and young men alongside Rev. Ngala Emmanuel and other church leaders. He also has served as church usher for three years. Godwill loves music, and he is friendly, simple, respectful and hardworking.